A hands-on approach to horticultural training is helping adults of all ages find a new career in gardening. Across the county of Essex, a band of trainee gardeners is pruning, sowing, mulching, weeding and mowing. 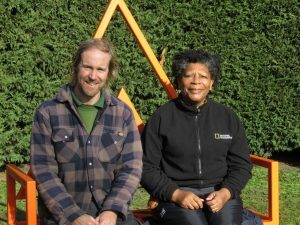 The apprentices are quietly learning their trade in privately owned gardens thanks to a scheme which has been running for over 25 years. 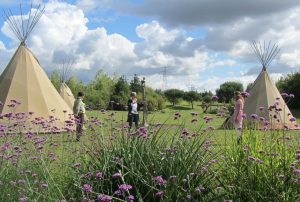 WRAGS was launched in 1993 to provide hands-on practical horticultural training in a carefully sourced garden, under the instruction of a garden owner or head gardener. The gardens offering placements range from those specialising in a specific area of horticulture to large, all-encompassing estates and as such provide a range of practical challenges to the trainees, all keen to hone book-learnt skills in the great outdoors. Many of these gardens also open to the public as part of the National Garden Scheme and interestingly, last year, the National Garden Scheme granted a bursary to WRAGS, the aims of the two charities dovetailing nicely, both keen to support those looking for a career in the gardening sector and to encourage enthusiastic amateurs with affordable training. At the end of the year Annette is hoping to become a self-employed gardener and in addition use her skills to provide horticultural therapy to children living with disabilities or ill health, or who are disadvantaged or vulnerable. Barnards Farm in West Horndon, Brentwood CM13 3LX is opening for the National Garden Scheme every Thursday until 29 August and on Sunday 30 June and Sunday 1 September, see www.barnardsfarm.eu for full details. Visit www.ngs.org.uk for information all gardens opening for the National Garden Scheme this year and you can find more about the WRAGS training scheme and gardening workshops at www.wfga.org.uk . 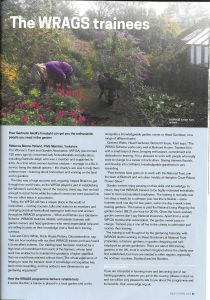 We are delighted to report that Rebecca Moore-Yelland our Regional Manager for Yorkshire has had the following article published in the PGG magazine this month. A visit to Megginch Castle’s Scottish Heritage Apple & Pear collection.